The State Department for Housing and Urban Development appreciates the role of KARA over the years in facilitating conversations on issues touching on the built environment. 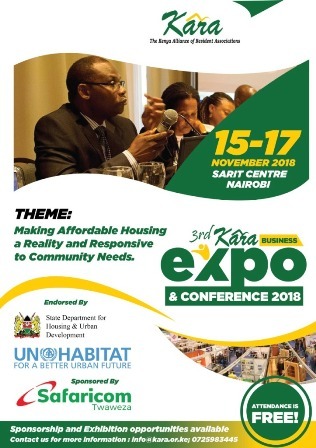 The theme of the KARA Business Expo and Conference: Enhancing quality of urban life in Kenya through Resident Associations is indeed appropriate as it comes at a time when the Government is facilitating the provision of one million affordable housing units by 2022. I am delighted to be Chief Guest for the KARA Annual Resident Associations Excellence Awards 2017. This event comes at a very prime moment when Kenya is hosting the United Nations Environment Assembly with the theme “Towards a Pollution Free Planet”. I am aware some of the engagements by the Resident Associations contribute to this theme. The Kenya Alliance of Resident Associations (KARA) hosted the first ever Annual Resident Associations Excellence Awards (AREA) Ceremony on 2nd December 2017 at Sarit Centre. The ceremony, which was part of the 2nd KARA Business Expo and Conference event, was presided over by Prof. Judi Wakhungu, the Cabinet Secretary for Environment and Natural Resources. AREA is designed to reward Resident Associations that have demonstrated exemplary performance in promoting sustainable development and access to better public services in Kenya. The government through the State Department of Housing and Urban Development has established a secretariat to drive implementation of New Urban Agenda (NUA) in Kenya. Kara in collaboration with Nairobi City County Government (NCCG) and United Nations Environment Programme (UNEP) developed Non Motorized Transport (NMT) Policy for Nairobi County. Participants at the Kara Bimonthly Talk Series forum held on 17th October 2017 challenged the government to set aside funds that will facilitate effective public participation in Kenya. Nakuru and Eldoret towns are set to become cities if a bill approved by cabinet is passed. Kara signed the Urban Boards Non State Nominating Agencies (UBNSNA) cooperation agreement during a breakfast meeting convened to provide updates on the progress made by UBNSNA. Preparations for the 2nd KARA Business Expo & Conference event to be held on December 1 – 3, 2017 at the Sarit Centre, Nairobi are in top gear. The rapid spread of cell phones across the globe creates new opportunities to engage citizens to improve public transport in our cities. The 2nd Kara Business Expo & Conference event is slated for Friday, 1st December to Sunday, 3rd December at the Sarit Centre. The much publicized ban on plastic bags took effect on 28th August 2017. 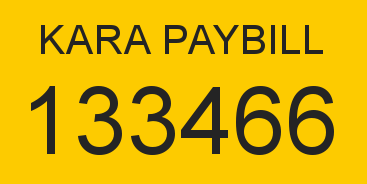 On 28th February 2017. The government has lifted the extension and renewal of land leases. The process was halted in December 2016 to allow the formulation of guidelines that would guide the process. The Association for Research on Civil Society in Africa (AROCSA) held its annual conference on 27th to 29th July 2017 in Johannesburg, South Africa. Kara was accredited by the Independent Electoral and Boundaries Commission (IEBC) as an observer in the just ended general elections. In the run up to the just concluder General Elections, Kara held a series of gubernatorial candidates debates to provide a platform for county residents to engage the candidates on service delivery agenda. Suleiman Shahbal has declined Hassan Omar's offer to serve as his county executive committee member should the Senator become Mombasa governor. Kara in partnership with the Civil Society Urban Development Platform (CSUDP) has convened a consultative meeting geared towards broadening participation in the Urban Boards formation process. Kara organized the 7th training workshop for key county leaders on election and transition management. The objective of the workshop was to equip participants with the necessary knowledge, skills and capacity to effectively prepare and participate in the elections as well as understand how to manage transition post-elections. The Nairobi City County Assembly has adopted the Non Motorized Transport (NMT) Policy whose objective is to provide a framework for harmonization, prioritization and coordination of NMT infrastructure, facility development and maintenance in Nairobi.